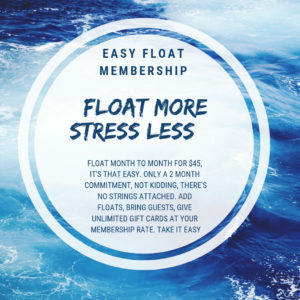 There are a couple of benefits that we sometimes forget to mention…with a monthly membership, you are welcome to bring a guest at your membership rate once per month or give a gift card at your rate, you cannot give away your float though. Also, add as many floats as you like at your membership rate. Your floats do not expire unless you cancel, you can roll floats over to the next month and accumulate up to 6 floats. Please let us know if you have any questions, we love our members! It is very important to us that everyone has flotation available to them and we are dedicated to providing the absolute best float experience. We also understand and encourage folks to find a gym they like or a yoga studio that works for them. So hopefully our membership pricing makes floating available and accessible to everyone without having to give up something else that contributes to your well being. There are a number of healthy lifestyle practices out there and we cannot stress this enough, we genuinely encourage anyone looking to live an improved life to find some good practices that work for them. We definitely realize that flotation is not for everyone, and we are ok with that. But we’re not ok with putting floating out of the reach of anyone interested in getting into a float tank. We do believe (strongly) that floating should at least be for everyone even if it’s not for everyone. Please let us know if there is something missing from our float offering or if you know someone stressed to the max and could use a float session, we’ll make it happen. Floating is an amazing practice, and floating regularly can make a real positive impact; we believe a balanced lifestyle includes floating.